Submitting your work to agents can be frustrating. Especially when your efforts result in "not right for our list" rejection emails . . . or nothing at all. The culprit could be an abundance of "red-flag" words in your query, synopsis, and sample pages. When I was a Time-Life and acquisitions editor, I rejected any submission that contained more than a few red-flag words. Why? Because, these issues surely would appear in the manuscript and doom it as being un-worthy of publication. After 80 submission rejections, I asked Molli to take a look at my manuscript. She helped me identify red-flag words and writing mechanic errors. What a difference this made! After major revision, I re-submitted my work and landed a publisher. . . . from author Emily Will. Do you believe the myth that agents don't want to be bothered by unpublished writers? Nothing could be further from the truth. Agents want to meet you and determine if you are the "real deal," a talented writer with a saleable manuscript. What prevents agents from responding positively (besides a poorly written query letter) are submissions filled with red-flag words. HAD -- WERE, and the worst RED FLAG of all, the deadly duo of “WAS” when paired with an “ING” verb. Do these rascals proliferate in your work? If so, they will identify you as a writing “rookie, ” not ready for prime time. No writer wants that! After purging my manuscript of red-flag words, I return to my work in progress, once again to engage in hand-to-hand combat with a renewed sense of readiness. Molli's mini-tutorial helped me identify the most inauspicious of the adversaries I face, and gave me the tools to defeat these words capable of destroying my chances of becoming published. Thanks Molli! . . . from Samantha Charles, author of "Redemption: a Parson's Gap Story." 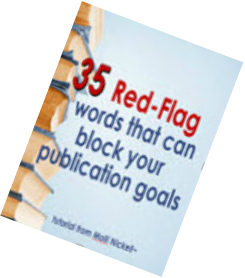 Contains the full list of 35 red-flag words. Demonstrates a unique Search-Mark-Revise process to help you find and remove these submission assassins from your work. Increases the potential that your query, synopsis, and sample pages will be read instead of being sent to delete-ville. Costs about the same as a cafe latte topped with whipped-cream, but expands your mind instead of your waistline! you need to order these . . . . . .
One Click will take you to MolliMart to order a writing tool you won't find anywhere else. One Click will jump start your publishing career as you polish your submission and move ever closer to fulfillment of your goals: agent/book contract/shelf space at Barnes and Noble.